My husband and I are "Dancing With the Stars" - Baltimore's version -- to support The Alzheimer's Association on Saturday, April 28, 2018 at 7 p.m. at the Baltimore Marriott Hotel, Waterfront. Every dollar donated will be a vote for Jenette & Charles in support of those with Alzheimer's. Vote, buy tickets and donate to the 2018 Baltimore Memory Ball here. Jenette Young is the President/Owner of ComForCare Home Care Services of Randallstown, Maryland encompassing Baltimore City, Baltimore County, Carroll County and surrounding areas since June 2009. Her company satisfies the personal care and companionship needs of our senior adult community and persons in need of care due to sickness or surgery. Jenette is an accomplished mentor and has received multiple awards for her development of others including "Mentor of the Year". She has been on the Steering Committee of Giant's Networking Women Program and has spearheaded many of the Minority Mentor programs. Her additional awards include: being ranked as a Top 100 Minority Business Enterprise amongst minority enterprises in the Mid-Atlantic Region by the Mayor of Baltimore, 2014 Brava Award - honoring top female CEOs by Smart CEO and being named 17th Fastest Growing Women-Owned Business in 2014 by the Baltimore Business Journal. Through her positive impact on the community, Jenette has shown that women can attain personal success and help others grow in the process. This year, five amazing women will be recognized for their accomplishments as Spirited Women in Entrepreneurship and Jenette is one of them. Martin (Marty) and Jeannette Fedder have spent most of their lives together. The couple has been married for an impressive 72 years. Now in their 90s, they are happy to still be living together in their long-time family home. One of the primary reasons the Fedders have been able to remain in their home in Maryland is the help of in-home caregivers provided by ComForCare Home Care Services. The ComForCare office in Randallstown serves Baltimore County, Baltimore City, Carroll County and the surrounding areas. Licensed by the state of Maryland, the company provides experienced, professional caregivers who meet rigorous hiring standards. Robbie Leonard, chair of the Baltimore County Democratic Party, presented service awards to Jenette Young, president/owner of ComForCare Home Care of Randallstown, as a business leader, and to Terry Cavanaugh, executive director of Service Employees International Union (SEIU) Maryland and D.C. State Council, as a labor leader. I am honored to represent The Women on the Move Committe of the Multiple Sclerosis Society on Channell 11 on Thursday, September 3. ComForCare Home Care Services is a sponsor for the great cause of making persons aware of MS and stamping out MS. Please purchase tickets for our event September 17 from 6:00 pm - 9:00 pm here. Thanks! Congratulations Jenette for recognition of your support for "Women on the Move" by MyCity4HER. MyCity4HER is pleased and proud to support the upcoming "Women on The Move" at the American Visionary Art Museum on Thursday, September 17, 2015 from 6 to 9 pm. Ober|Kaler Attorneys at Law is the presenting sponsor. Jenette Young, the Owner and President of ComForCare Home Care Baltimore is also involved. We have been long time fans of Jenette, having first featured her in a MyCity4TV episode years ago in 2011. 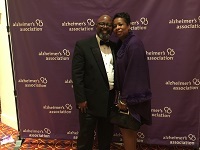 Jenette and Charles Young, ComForCare Home Care, attend the Alzheimer's Association Memory Ball - Dancing Stars fundraiser event on Sunday, April 17, 2015 at the Baltimore Marriott. The event benefits those with Alzheimer's. The Alzheimer's Association is the world's leading voluntary health organization in Alzheimer's care, support and research. ComForcare Home Care Services - NW Baltimore County - sponsored and hosted the 100th Birthday celebration of Mrs. Mindelle Moon on Friday, February 14, 2014 at newly opened Collins Seafood and Grill in Randallstown, Maryland. Mrs. Moon arrived via limousine and was greeted by ComForcare staff and cargivers, family, friends and community well-wishers. She was presented with proclamations from the Baltimore County Executive's Office, the Mayor's Office and the Senator's Office. Ms. Moon received birthday presents, flowers, a crab cake lunch and cake.